Porch enclosures offer almost unlimited potential to your home. They create another functional room to your home without having to actually construct a whole new room. They blend your outdoor and indoor space, and they help you to enjoy your porch all year round. In fact, there’s so much you can do with your porch enclosure that it can be exciting just going through the current design trends and ideas for them. Some of these ideas have been around as long as porch enclosures, while others come and go with the waves of design trends. But here are some of our favorite porch enclosure trends that you can employ now. If you can install a gas hookup in your enclosed porch, a fireplace could be a stunning addition and a great way to set the tone. If you don’t have a gas hookup in the porch enclosure, however, there are artificial fireplaces now that can be quite convincing. You can choose something with a grand brick wall or something more sleek and modern. A fireplace can be a great way to draw guests into the porch enclosure for entertaining or to enjoy your porch enclosure during the coldest months. Rustic has remained a prevalent design style for years now, and it really shines in spaces that combine the beauty of the outdoors with the convenience of indoors. If your porch roof has wood rafters, leave them exposed for added character. Dark wood or wicker furniture fit perfectly with this aesthetic. Here, you’re going for earthy, warm, and beautiful in its simplicity. Throw in a couple statement pieces for character and you’ll have the perfect rustic porch enclosure. On the other hand, why not make your porch enclosure stand out with bold yellow pillows, brightly painted side tables, or colorful decking? Because your porch enclosure is protected from the elements by the porch screen, so you have more freedom with the materials and colors you use. You can add color with the furniture or paint, or you can add a few colorful potted plants for a more natural infusion of color. Do you like to paint or draw? Maybe you need a calming place to quilt or a room with plenty of light where you can get some writing done. Artistically inclined homeowners love enclosed porches, because they can easily make a studio or craft nook of sorts out of them. You’ll have no shortage of inspiration, and of course, plenty of light. An enclosed porch is still a porch, and there are a few porch classics that just never get old. One, for instance, is a porch swing. In fact, you might even enjoy your porch swing more when you can use it all year long and don’t have to neglect it during the coldest days or rain storms. Hanging plants is another old standard that’s well-suited to porch enclosures as well as open porches. There are endless trends and functions to choose from. Which do you want to use in your porch enclosure? 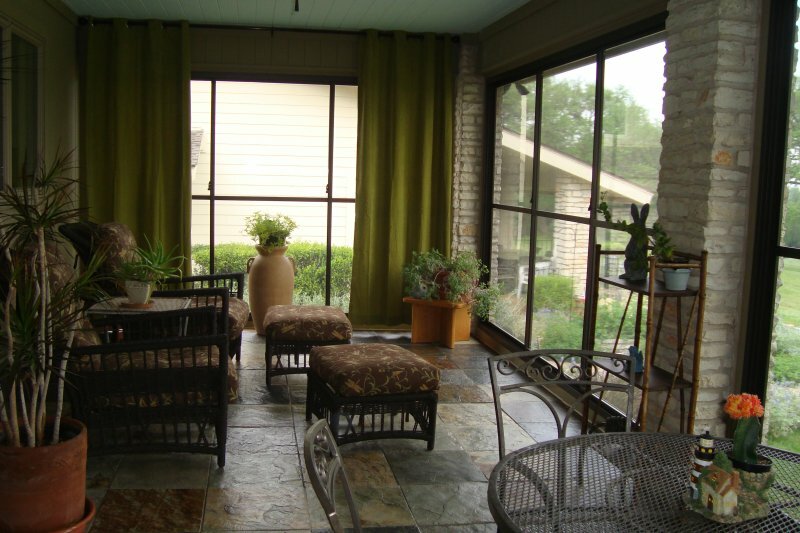 Contact Sunspace Texas today to schedule your porch enclosure installation.